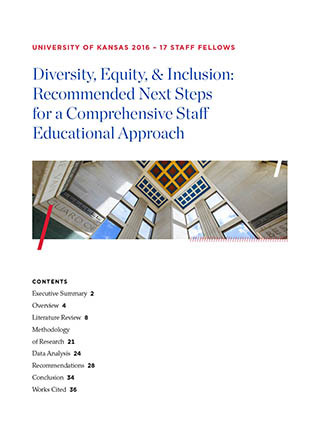 University Staff have the unique opportunity to build their capacity as leaders, gain experience to grow their careers, and simultaneously work together on a campus project. This select group of KU employees will receive leadership training, mentoring from senior administrators, and an expanded view of university initiatives while working together on a yearlong project that benefits KU. The Office of the Provost and Department of Human Resource Management jointly sponsors the program. Whether asking for support on a specific issue, or consulting on how to get our work done, Jayhawks are interacting with each other every day. The 2018-2019 Staff Fellows will focus on a project that examines and evaluates the effectiveness of internal services throughout our campus and how we support one another during these experiences. 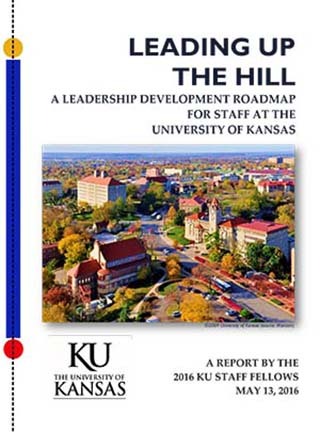 With their findings, they will propose an internal service delivery framework for the University of Kansas. “Internal services” is a broad term, encompassing the many services, including activities and resources, provided by distinctive organizational units or the people working in these departments to other units or employees within the organization. Internal service quality has a powerful effect on employee satisfaction, commitment, and employee well-being, which in turn positively influences employee performance. This year’s Staff Fellows cohort will assess the extent to which internal service quality should be improved, and if so, the ways in which this could be achieved. This important work helps an organization meet or exceed the expectations of its employees while setting the stage for continuous improvement. This professional development program provides leadership development for employees at all levels of the organization, including those without direct reports, and/or operational, group or department managers. Through this program, participants will gain familiarity with campus, engage university senior leaders, explore leadership through mentoring, assigned readings, and project work. Participants meet for three-hour sessions during the academic year in addition to attending the KU Staff Leadership Summit. During the program year, participants are expected to attend all three-hour sessions and to commit time in between sessions to complete readings, meet with their mentor, and perform project-related assignments. Lessons on project management and methodologies are drawn upon to complete the yearlong project and can be utilized in participants’ respective work environments. 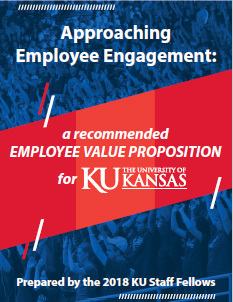 The University of Kansas is committed to professional development and as a result, there is no cost to participate. Unclassified Professional Staff (UPS) and University Support Staff (USS) with two continuous years of full-time employment at KU. The ability to commit to a three-hour time block twice per month along with time in between sessions to complete readings, attend mentoring and perform project work. Interest and availability to work on a group project throughout the duration of the fellowship. Enthusiasm for the larger mission of KU and desire to engage in that mission. A history of exceptional work at the University of Kansas, as documented by a supervisor’s letter of endorsement addressing the candidate’s potential for leadership. The ability to work collaboratively with a cohort of other fellows in a seminar style of learning. Interested staff should complete an application, which includes information about the candidates’ career at KU, along with completion of several short essay questions. The essay questions focus on career goals, interest in the program, suitability to the program, and overall interest in the yearlong project topic. Upon completion, candidates’ supervisors receive an email requesting support for the application. A review committee then meets with select candidates for a short interview. Following the full review process, the committee selects a cohort of employees to participate in the program. Please contact Human Resource Management at hrdept@ku.edu or 785-864-4946 for more information about the program.